A spooky old house, a historical mystery, an underground mine and a rising tide . the stage is set for an exciting, real-life adventure! A network of tunnels leading under the park, a secret exit to an abandoned mansion, a hidden box of documents.all very mysterious, but it's just a game, right? When shadowy figures start watching every move they make, Kitty, David, Andrea and Martin know they've stumbled onto more than a forgotten piece of history. They need to find all the answers fast, before someone beats them to it. Jennifer Walsh grew up in a country town, the youngest of three girls. 'When we weren't jumping off haystacks we were reading. Our father read aloud to us, starting with Great Expectations and Black Beauty and proceeding to stories he made up himself.' She became a teacher, later worked in the theatre for many years, then 'accidentally' became a writer of computer user guides, a job that took her around the world. Jennifer lives in Balmain with her husband, actor Bruce Spence, and a tortoiseshell cat. The Tunnels of Tarcoola was inspired by the abandoned coalmines that really do exist under much of Balmain. This exciting story jumps straight into the action and moves quickly through a racey plot that involves exploring underground tunnels, searching abandoned mines, investigating an old house, researching history and solving a decades old mystery. The author has woven an intriguing story that is not entirely unlikely, using plausible characters that children could easily relate to. Inspired by the existence of long unused mines running under Balmain, Jennifer Walsh raises a 'what if?' scenario with her characters searching these mines, in the first instance, for fun mingled with a little bit of rebellion, and, later, with a serious purpose as they are pursued by the goons (or was it goofs, or perhaps ghouls?) of a local businessman of somewhat shady reputation. As they race to solve the mystery and restore an elderly woman's past before the beautiful old house is destroyed forever, they learn about the history of their area, Japanese submarine's in Sydney Harbour during WWII, and about the horror that European Jews endured at that time. Tunnels of Tarcoola is a good old fashioned adventure story, where the children as the main protagonists are the ones who save the day, updated to current times and relevant to today's younger generation. In the classroom this book is able to deliver a few messages, from thinking through what you do before you do it to how you can learn about local history. It might even be one way to introduce a similar assignment to either Kitty's or Andrea's, looking at what you can find out about by interviewing older members of the community. Or, maybe, why it isn't particularly wise to go exploring in caves just before the tide turns! I would also read it to or with a class just for fun. It is a great adventure, cleverly conceived and with pacey writing that would keep children turning the pages and interested in the characters (who have just enough depth to feel real without too much description to slow the pace down). I would recommend it for Year 5 upward, for reasonably confident readers. A rollicking good story this, a brilliant tying together of past and present as four 21st century Australian children discover for themselves the back story of the elderly resident of a nursing home whose personal history is the matrix of their adventures. Set a local history task for school, they learn about wartime Europe and the Holocaust through their investigations of their contact’s supposedly senile ramblings and the unfolding of her past experiences. A mix of modern day kidnappers, mobile phones and internet together with memories of Sydney Harbour’s Japanese midget submarine invasion in 1942 and post-war life in a gracious mansion, this story is fast paced and high interest, easy to read and hard to put down. I found the characterisation particularly well done. The author has created very distinct personalities for each of the children and their individuality is subtly woven into the storyline. 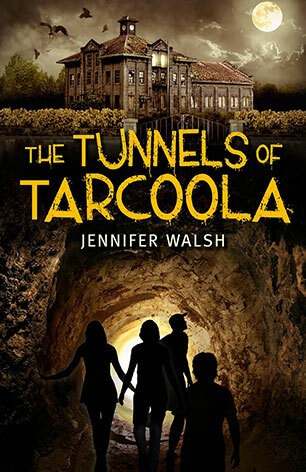 The tunnels of Tarcoola is highly recommended for students of Middle School age, both boys and girls. As such it would work well as a class text for Year 8 or 9, as well as for individual reading, particularly for those who like an adventure novel with an historical flavour. A peek at Jennifer Walsh’s website indicates a second novel involving the four children from this book is a future possibility. Look out for it down the track! Four kids (Martin, Kitty, Andrea and David) are exploring when they stumble across a tunnel which leads back to the Haunted House in their town. A project at school ties it together when they discover the old lady in the care facility used to work in the house and has hidden something special. The children’s parents are connected to their exploring when they realise the protest meetings the parents have been attending are to stop the haunted house from being demolished. The kids are informed by the parents and they set about finding the documents needed to save the house. The first few chapters set up the story and the connections. It is not long before the excitement builds and the reader wants to keep reading to find out what happens. The short chapters and accessible text make it easy to read. The readers of this book would be able to make many text-to-self connections as it explores feelings and activities of their age group. Throughout the book the issues of fitting in and feeling adequate are showcased and discussed. The reader is shown that by working together you can make a difference. It would also be a great book to use when talking about local history and shows that the best history is not always that which is written down but which comes from the residents who have lived there for a long time. It also shows the value of the young talking with the old with benefits on both sides. Four young people trapped in a cave by the tide which has come in while they are in there, who could think of a better opening to a novel? It immediately draws the reader’s interest. How are they going to get out? They end up in the cellar of an abandoned mansion, Tarcoola. Unused tunnels which run under the suburb of Balmain, a hidden box with a secret drawer with a necklace and documents plus interaction with an elderly resident of a nursing home in the area all contribute to David, Andrea, Kitty and Martin understanding more of their local history. It also brings to light events of World war 11. But David, Andrea, Kitty and Martin are not the only ones interested in Tarcoola. Adults threaten to stop them discovering the truth about the real owner of Tarcoola, because they have a vested interest in the property. For those of us who grew up with the adventure stories like The Secret Seven and Famous Five, this is an adventure story along those lines. However it is also firmly set in the modern day making use of mobile phones and the internet. It is easy to read because it moves at a fast pace and the characters of each of the young people are well defined. As well as being a good read children will learn something of history that could lead into lessons about World War 2, local history of the area where students live, or perhaps a similar experience of interacting with residents of a nursing home to learn their oral histories. Aside from using it as a teaching tool, it is a good book to read for fun and one sure to hold the attention of even reluctant readers. Suitable for upper primary and junior high. From the very start this book is exciting, full of adventure and captures the reader’s imagination. Tunnels from the ocean leading to an old abandoned mansion, dead ends and cryptic messages are a recipe for an old-fashioned rollicking escapade. The four main characters Kitty, David, Andrea and Martin stumble upon a network of tunnels that leads to a mansion called Tarcoola that hasn’t been lived in for years. The mansion and nearby coal mine are set to be demolished and replaced with a new housing development. However there is a dispute as to who actually owns the land. Through a local history task set for school, the children learn about the Japanese submarines in Sydney Harbour, the treatment of Jews in Germany and discover how all of this is connected to the mysterious Tarcoola. It is up to the group of young people to find the vital missing information in order to save Tarcoola and set an old lady's mind at rest. The Tunnels of Tarcoola is an excellent addition to the realistic adventure genre and is of particular interest to 11 to 13 year olds. The four protagonists are brought together in a loose friendship because they live in the same neighbourhood and are enrolled in the local primary and secondary schools. Their adventures begin when they explore a tunnel exposed at low tide that leads them under a deserted house that is the centre of a dispute for demolition and property development. When Kitty interviews an elderly resident of the nursing home for a school project, old Mrs Gordon’s confused memories hint at links between the house, a lost treasure and family mystery. Unravelling the mystery leads the children into exciting and dangerous escapades building to a climax that draws the many facets of this adventure together. The characters are deftly drawn and their varied ages, gender, interests, family situations and economic circumstances provide interest and build credibility in the story as their human strengths and weaknesses are integral to how the plot unfolds. The Sydney location of the book is also significant to the plot and local readers will enjoy identifying places that the children visit in their quest to gather information. Conservation issues involving the parents gradually gain meaning and relevance to the children as their involvement with Miss Gordon and the deserted house grows. The historical investigations that Kitty and Andrea undertake provide a realistic and credible example of the importance of historical events in present day decision making and the investigations the two girls undertake could be used to model historical inquiry in the classroom and as a springboard to identifying and location local primary resources. The role of the local library in supporting local history research could have been presented in a more positive way. The Tunnels of Tarcoola is bound to be a popular read for both boys and girls and the fast moving plot and interesting mix of characters will also make this a good read aloud for the upper primary classroom.